..... Click the link for more information. and the radio galaxies (galaxies whose radio emissions constitute an extraordinarily large amount of their total energy output) Centaurus A and Virgo A. Other types of galaxies, particularly Seyfert galaxies (galaxies with extremely bright cores that are strong emitters of radio waves, X rays, and gamma rays), also emit X rays. The center of our galaxy is a strong X-ray source, which is an indicator of the violent activity taking place there. ..... Click the link for more information. ) whenever amateur astronomers with backyard telescopes reported it in outburst. The few days' duration of these outbursts allowed enough time to change the satellite's observing schedule so that it could examine the star, and it discovered the source of the star's X-ray emissions. ..... Click the link for more information. ), Tenma, and Ginga. These missions were more modest in scale than the HEAO program in the 1970s and were directed toward in-depth studies of known phenomena. ..... Click the link for more information. . Unlike other X-ray sources, this one burst, oscillated, and flickered simultaneously, with bursts lasting from 6 to 100 seconds. Before it burned out, the unexplained object was the brightest source of X rays and gamma rays in the sky, radiating more energy in 10 seconds than the sun does in 24 hours. BeppoSAX, a joint Italian-Dutch satellite, was launched in 1996. When on Dec. 14, 1997, for 1 or 2 seconds the most energetic burst of gamma radiation ever detected was recorded by the Compton Gamma Ray Observatory, BeppoSAX recorded the X-ray afterglow of the burst, thereby providing a relatively accurate location for the source. The Chandra X-ray Observatory was deployed from a shuttle and boosted into a high earth orbit in 1999; it focuses on such objects as black holes, quasars, and high-temperature gases throughout the X-ray portion of the electromagnetic spectrum. Also launched in 1999 was X-ray Multimirror Mission, an ESA satellite that carries an optical-ultraviolet telescope together with three parallel mounted X-ray telescopes, allowing it to simultaneously observe phenomena in two regions of the spectrum. The study of objects lying beyond the Solar System in the photon energy band 100 to 100 000 electronvolts (corresponding to wavelengths from 12 nanometers (nm) to 0.012 nm). X-ray observations are now an integral part of astronomy, relating particularly to galactic and extragalactic systems where violent or energetic phenomena give rise to copious high-energy particles or super-hot gas. Opacity of the terrestrial atmosphere throughout the X-ray band requires that observations be made above about 150 km and hence X-ray astronomy could begin only after high-altitude rockets became available. The first detection of a cosmic X-ray source was made by Riccardo Giacconi and colleagues in July 1962, during an exploratory rocket launch equipped with an X-ray detector to search for lunar fluorescence. Confirmation of this source (Scorpius X-1) and the discovery of a second source (Taurus X-1) in 1963 began an active period of rocket and balloon observations that, by 1970, had yielded 25–30 sources spread throughout the Galaxy; there was also one likely extragalactic source, apparently associated with the powerful radio galaxy Virgo A (M87). The first optical identification was of Taurus X-1, which was found to coincide with the Crab nebula supernova remnant in a classical lunar occultation observation by Herbert Friedman and his colleagues in the USA. 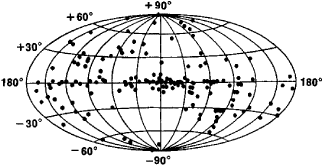 The launch of the first X-ray astronomy satellite, Uhuru, in Dec. 1970 accelerated the development of the subject, yielding many new sources including a large number at high galactic latitude. In particular, Uhuru discovered X-ray binaries and showed these to be the most common form of galactic X-ray source. A second major discovery was of powerful X-ray emission from clusters of galaxies, with evidence that this emission arose in an extended region comparable in size (about 0.5 megaparsecs) to the cluster. The launch of other X-ray astronomy satellite experiments continued the rapid expansion of the subject. The Ariel V sky survey extended the Uhuru catalog and led to the establishment of a second major class of extragalactic source: the X-ray Seyfert galaxies. Observations by Copernicus and Ariel V, followed by SAS-3, found the slow X-ray pulsators, periodically variable X-ray sources with periods of a few minutes, substantially longer than those of Centaurus X-3, Hercules X-1, etc. Ariel V, followed by the satellite OSO-8, discovered an emission line near 7 keV in the spectra of several supernova remnants and many of the rich clusters of galaxies, showing the X-rays to be of thermal origin, arising from hot gas at temperatures of 106 to 108 kelvin and containing an abundance of iron similar to that found in the Solar System. X-ray transients and X-ray burst sources were detected by several of the satellites. Optical identifications of a few of these have shown them to be most probably X-ray binaries in which the mass transfer or accretion rate is highly variable. Further major advances were made by the Einstein Observatory, whose greater sensitivity revealed substantial X-ray emission from a wide range of normal stars. This emission comes from the stars' hot coronae. More recent X-ray satellites, particularly EXOSAT, Ginga, ROSAT, and ASCA, have continued to extend the scope of X-ray observations to the point where it is now the major observational branch of high-energy astrophysics. Thus, for example, stellar activity, the form and evolution of young supernova remnants, the gravitational mass distribution and evolution of clusters of galaxies, the dynamics and energy processes in the centers of active galactic nuclei, as well as the study of accretion in the wide variety of compact-object binary-star systems, are most directly observed by their X-ray emission. This situation seems certain to continue with the diagnostic power of higher-resolution X-ray spectroscopy on future missions, such as AXAF, XMM, ASTRO-E, and Spectrum-X. the branch of observational and theoretical astrophysics that investigates the sources of cosmic X-radiation in the region of wavelengths λ from 100 angstroms (A) to 0.3 A. On the scale of photon energies, this range corresponds to 0.1–30 kiloelectron volts; however, both boundaries are defined rather arbitrarily. In order to conduct astronomical observations in this wavelength region, equipment is lifted above the earth’s atmosphere by rockets or artificial earth satellites, since X-rays are strongly absorbed in the atmosphere. Hard X-radiation can be observed at altitudes of approximately 40 km from high-altitude balloons. In space, X-radiation can be generated by a hot plasma with a temperature exceeding 106 °K in an optically thin or dense medium, by relativistic electrons in magnetic fields (synchrotron radiation), and by electrons in cosmic rays upon interaction with low-energy photons, for example, optical photons. The last mechanism is called the inverse Compton effect. The X-radiation of the sun was first detected from a rocket on Aug. 5, 1948, in the USA, although the existence of such radiation had been predicted previously on the basis of geophysical studies of the ionosphere. By the mid-1970’s, solar X-radiation had been investigated in detail throughout the entire spectrum. In the absence of chromospheric flares it extends all the way to 10–20 A. The presence of active regions on the solar disk leads to the appearance of hard X-radiation and gamma radiation (Figure 1). The continuous spectrum is mainly thermal in character, with a temperature ranging from 106 °K to 2 × 107 °K; however, a nonthermal component is also observed at the beginning of the development of a flare. X-radiation is generated within the solar corona and also in the chromosphere and the transition region of the solar atmosphere, which has an extremely narrow altitude range. The gamma radiation of flares, including line radiation, has also been observed. Lines of multiply ionized elements, such as Fe, Ni, Mn, Ar, and Co, are present in the X-ray spectrum. Basically, the spectra of hydrogenlike atoms that have only one remaining electron are observed. Photographs of the solar disk in the soft X-ray region of the spectrum have been obtained by means of grazing-incidence optics. Polarization of X-radiation during flares has been observed. Discrete sources of cosmic X-radiation were discovered by accident in 1962 during a search for lunar fluorescent X-radiation caused by cosmic rays. By 1975, more than 150 sources had been registered. Most of them are concentrated toward the galactic plane, which indicates that they are few in number (according to various estimates, there are only 103–104 such sources in the Milky Way Galaxy) and that the majority are located in the galactic disk (Figure 2). The flux from the brightest source—Sco X-l, in the constellation Scorpio—is equal to 20 quanta/(cm2.sec) in the spectral region 2–8 Å. 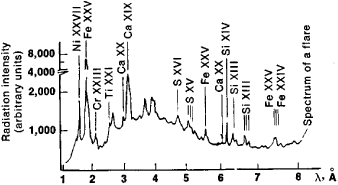 The weakest sources recorded by 1975 have a flux of 10-3quanta/cm2-sec) in the same region of the spectrum. Only a small number (approximately ten) of the galactic sources have been identified with objects that have been investigated optically; these include the remnants of supernovas. In this case, two types of radiation are observed: synchrotron radiation from an extended nebulosity and thermal radiation from an expanding gaseous shell and from the interstellar gas heated to a temperature of 106 °K. The radiation of a supernova remnant, which is most likely a neutron star, is sometimes observed. The X-radiation of the Crab Nebula (Tau X-1, the second brightest source) with a flux of 2 quanta/(cm2.sec) has a pulsating component with a period of 0.033 sec, which coincides with the period of the optical and radio-frequency radiation of a pulsar. Figure 2. Distribution of known X-ray sources in the sky, plotted in galactic coordinates. The center of the Milky Way Galaxy is in the middle of the diagram. X-ray sources belonging to binary stellar systems, such as Her X-1, Cyg X-1, Cyg X-3, Cir X-1, and Cen X-3, have made it possible to investigate in detail the systems’ physical parameters. One such source, Cyg X-l, is probably an object that arose as a result of gravitational collapse (a black hole). The mechanism of the X-ray emission of such sources is the flow of gas from the surface of an ordinary giant star to a neutron star or black hole—a process called disk accretion. Most of the X-ray sources have not been identified with objects observed in the optical spectrum. About 30 sources have been identified with extragalactic objects. These, in particular, are nearby galaxies (the Magellanic Clouds and the galaxy M31 in Andromeda), clusters of galaxies, the radio galaxies Virgo A (M87) and Cen-taurus A (NGC 5128), the quasar 3C 273, and Seyfert galaxies. In addition to discrete X-ray sources, an isotropic X-ray background is observed. Its spectrum in the range 1–1,000 kiloelectron volts is given as a first approximation by a power law. The isotropic background apparently has an extragalactic origin; however, the mechanism of its emission is not yet clearly understood. Some probable hypotheses point to the inverse Compton effect of intergalactic electrons with infrared photons of active galaxies and submillimeter quanta of the radio background radiation, the superposition of radiation of many unre-solvable, distant extragalactic sources, the thermal radiation of hot intergalactic gas, and various combinations of these mechanisms. Special photographic materials (for solar investigations), Geiger counters, gas-filled proportional counters, and scintillation counters are used as radiation detectors in the X-ray region. All types of detectors provide a spectral resolution of 1–20, depending on the energy of the registered radiation. The area of proportional counters used to obtain the basic results reaches 1,000 cm2. Collimation (restriction of the field of view) is achieved using honeycomb or slit collimators, which are assembled from thin, perforated steel baffles and having a maximum angular resolution of approximately a few minutes of arc, modulation collimators, which are two or more rows of metal filaments stretched in parallel and have a maximum resolution of approximately 20″, and grazing-incidence hyperbolic and parabolic mirrors, with an angle of incidence greater than 88°, that is, nearly at the tangent to the plane of the mirror. Such mirrors are suitable for obtaining an image formed by soft X rays (λ > 10 Å) with a resolution up to 5″. Bragg crystal spectrometers are used for spectral studies (thus far, only for solar studies). X-ray astronomy is one of the rapidly developing branches of extra-atmospheric astronomy. It shows great promise in connection with planned launches of rockets and artificial earth satellites carrying large counters and mirror telescopes with an area of 104-105 m2. Ozernoi, L. M., O. F. Prilutskii, and I. L. Rozental’. Astrofizika vysokikh energii. Moscow, 1973. Ginzburg, V. L. O fizike i astrofizike: Kakie problemy predstavliaiutsia seichas osobenno vazhnymi i interesny mi?, 2nd ed. Moscow, 1974. The study of x-rays mainly from sources outside the solar system; it includes the study of novae and supernovae in the Milky Way Galaxy, together with extragalactic radio sources.